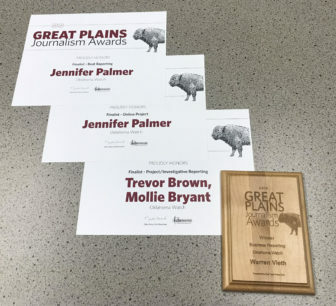 Four Oklahoma Watch reporters captured honors in the Great Plains Journalism Awards, an eight-state competition among print, web and television outlets, for work published in 2017. Jennifer Palmer, education reporter for Oklahoma Watch, was a finalist in both beat reporting in the newspaper division and online project in the multimedia and web division. State government reporter Trevor Brown and reporter Mollie Bryant were finalists in investigative reporting in the newspaper division, for their stories on efforts by corporate interests and lobbyists to influence policy at the State Capitol. Oklahoma Watch contributing reporter Warren Vieth won first place in business reporting for his story analyzing how oil and gas production plummets in the first few years of the life of a well – when gross production taxes are lowest. The story was based on a study commissioned by Oklahoma Watch from Wenzel Technology LLC, adata analysis firm. Palmer’s investigative work produced a series of ground-breaking reports, including exposing the use of “seclusion rooms” in schools to isolate special-education students; revealing that some schools were “lunch-shaming” students whose meal accounts weren’t paid in full; and reporting that schools were leaving millions of federal dollars on the table that would allow them to expand free meal programs. Her stories led directly to efforts to change state laws.